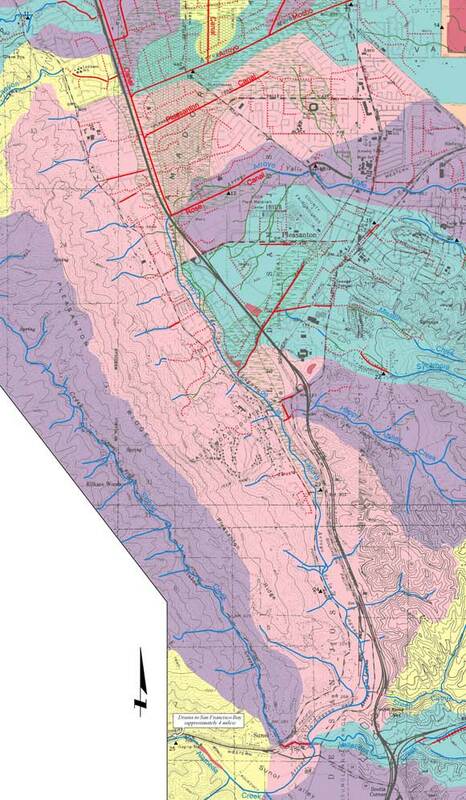 The Arroyo de la Laguna Watershed is the pink area in the middle of the map. Sinbad Creek is the watershed to the west, shown in purple. The heart of the Amador Valley used to be Tulare Lake, a large, shallow lake, fed by creeks, springs and seeps, and largely overgrown with tules and willows. (It is indicated on the map by the green marsh-stipple pattern.) Whether by creek flows or seeping groundwater, this lake received all the runoff of the Amador Valley and the huge watersheds of Arroyo Mocho and Arroyo Valle, stretching far to the south. This lake drained the short distance to its confluence with Alameda Creek, near Sunol, via Arroyo de la Laguna. Thus while the immediate watershed of this short creek is correspondingly small, confusingly, the name Arroyo de la Laguna Watershed can also be applied to the entire region it drains - the Amador Valley including Arroyos Mocho and Valle.